You've probably heard of a condition called rosacea, but did you know that it can affect the eyes? Rosacea is a condition that commonly affects the nose, face, and chest. Rosacea can be chronic and have periods of remissions and flare-ups. It can be very disruptive at times, causing the cheeks, nose, chin, and forehead to develop redness and swelling. Over time, the skin develops a thickening often referred to as a "ruddy skin complex." Small blood vessels begin to grow and become more visible. Over time, the skin can also become bumpy and the nose may grow larger and swollen. Pustules or pimples can also erupt from time to time. Rosacea usually shows up in your 30s. It is the skin condition that gave W.C. Fields, the late comedian, his recognizable nose. Ocular rosacea can occur without the facial signs and symptoms, but most often it is an extension of the condition. Ocular rosacea affects about 20% of people with rosacea. 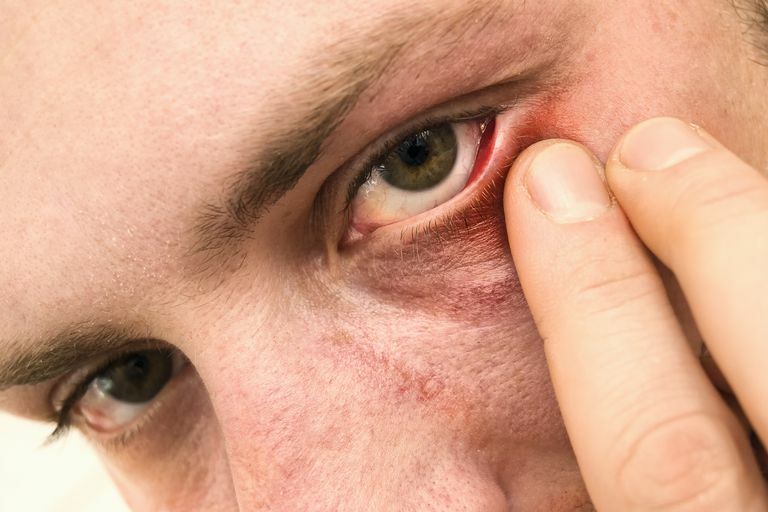 The eyelids may appear swollen and red and develop crusty debris. The eyes often appear red or bloodshot and can feel irritated. Some people complain of feeling as if a foreign body or piece of sand is in the eye. The eyes may tear and water or may actually feel very dry. Treatment of ocular rosacea is centered around managing the complications mentioned above, especially posterior blepharitis, which seems to be the most common and chronic expression of ocular rosacea. Most physicians believe in educating patients and explaining to them that rosacea can affect the eyes in many ways and those things can be treated. Tear film supplementation: Aggressive use of artificial tears that stabilize the oily layer of the tears, such as Soothe XP (Bausch & Lomb), FreshKote (Focus Laboratories) and Systane Balance (Alcon), are used to treat the fluctuation in the tear film and minimize dry eye syndrome. The important thing to keep in mind is that regular, generic artificial tears may not help. You will need to look for drops that are doctor-recommended or similar to the drops mentioned above. Lid hygiene: A Direct cleansing of the eyelids with a mild detergent has been shown to be beneficial. Warm compresses used in conjunction with commercially prepared eyelid scrubs are the mainstay in eyelid hygiene. In the past, physicians have recommended eyelid scrubs with Johnson & Johnson Baby Shampoo. However, recent research has shown that the baby shampoo ingredients can alter the tear film and eyelid chemistry, exacerbating the condition in some people. Lid hyperthermia: Lid hyperthermia is the direct application of heat (between 105-110 degrees Fahrenheit). When applied safely, heat lowers the thickness of the eyelid gland secretions and helps to control bacterial growth. Topical medications: Although topical antibiotics and antibiotic steroids can help, they carry higher risks of complication. Today, topical azithromycin (AzaSite) is the mainstay of topical treatment. Although AzaSite is not FDA-approved for this indication, it has been shown to improve both signs and symptoms of blepharitis and associated ocular rosacea conditions. The advantage of AzaSite is that it is an antibiotic with anti-inflammatory properties and contains no steroids. Supplements: For more severe cases, doctors recommend fatty acid supplements. The omega-3 in the fatty acid supplements acts to stabilize the meibomian glands in the eyelids, which are affected by rosacea. These supplements must only be used under a doctor’s supervision. Caution must be taken for patients also taking blood thinners, such as aspirin or coumadin. Oral medications: Oral tetracycline derivatives, such as doxycycline and minocycline, have shown to decrease symptoms by reducing bacteria’s production of lipases, chemicals that can change the consistency of the oil in the meibomian glands. Oral tetracyclines also produce an anti-inflammatory effect similar to AzaSite. However, sometimes the course of treatment can last for many months. Pulsed light: Pulsed light is treatment performed mainly by dermatologists to reduce skin pigmentations and remove hair. However, it has recently been investigated for use in treating ocular rosacea. Pulsed light works to constrict blood vessels and reduce inflammation of the skin. Kabat, Alan and Diana Shechtman. Current Therapeutic Approaches to Blepharitis Managment, Review of Optometry, March 2011. Shovlin, Joseph. Pulsed Light for Ocular Rosacea, Review of Optometry, April 2011.